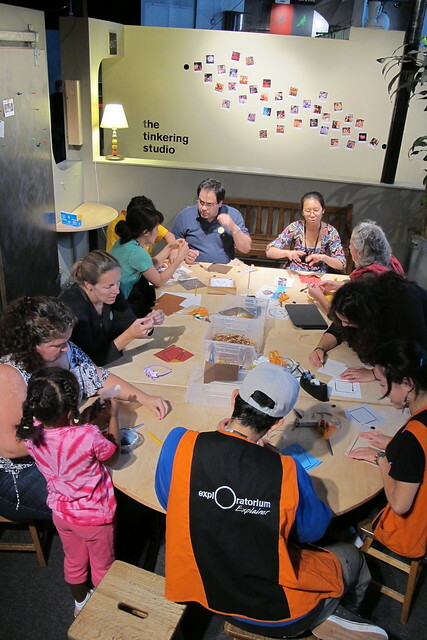 Trying out Jie Qi's paper circuit workshop in the Tinkering Studio! 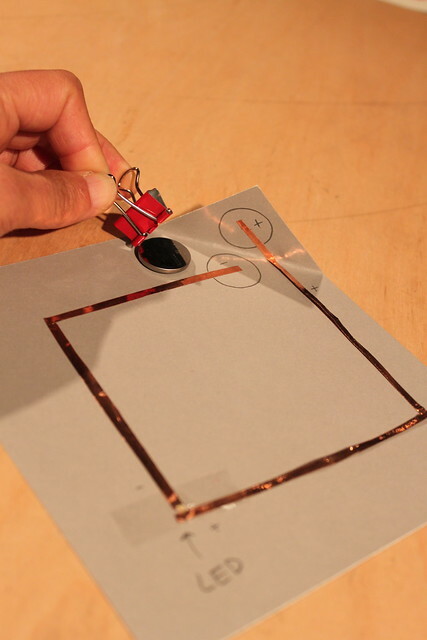 Last summer, we spent some time in making circuits on pop-up cards using copper tape, coin cell batteries, and LEDs (see our past blog posts 1, 2). This summer, we were very fortunate to have Jie Qi as visiting artist in the Tinkering Studio from the High-Low Tech group at MIT media lab. 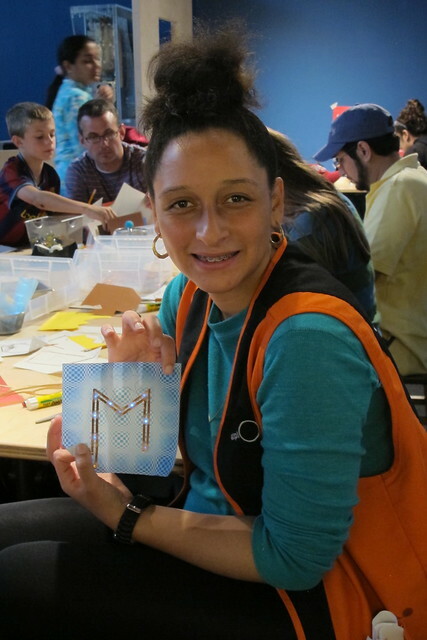 Last Friday, we hosted Jie Qi's paper circuits activity in the Tinkering Studio to explore furthermore on paper electronics with museum visitors. 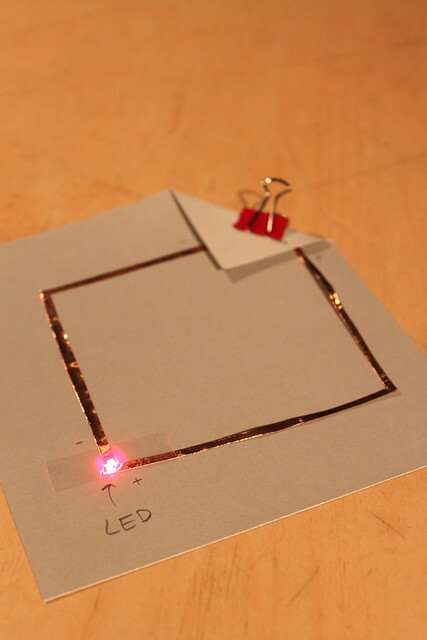 We started out the activity by showing visitors how to make simple circuits on paper, using super tiny LEDs and copper tape. 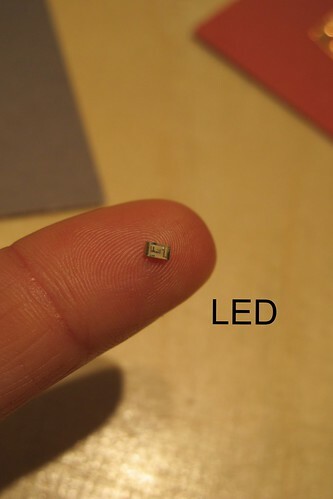 Most of the visitors had never seen this tiny LEDs (called Surface Mounted LEDs) so there were lots of oohs and aahs from everyone as we were showing the LEDs light up when completing the circuits. Jie also showed a simple way of holding a coin cell battery by sandwiching it on the corner using a binder clip. The teeny tiny LEDs can be simply scotch-taped to the copper tape. 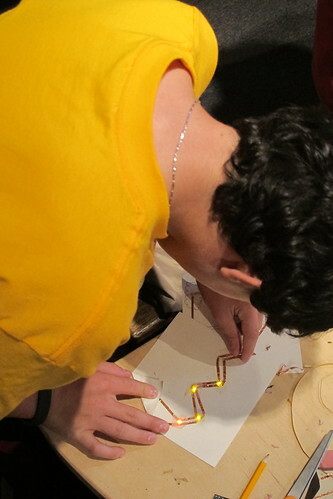 It was a bit challenging to deal with this tiny LEDs, so we were using a piece of scotch tape to pass it to visitors. Especially when visitors were trying to find the polarity of the LEDs (positive/negative side), having the LED on a piece of tape was helpful to move it around. 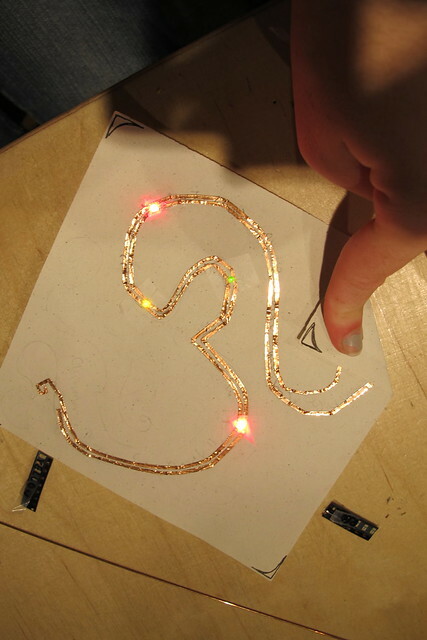 Some visitors made a shape or alphabet out of conductive tape and transformed them into LED circuits. Many of our High School Explainers participated in this activity, spending their half an hour shift in the Tinkering Studio, but with the limited time, only a few of them could finish their projects. However, those who couldn't finish the projects came back later to continue working on their projects! It was great to see the explainers coming back with the enthusiasm to finish their projects! 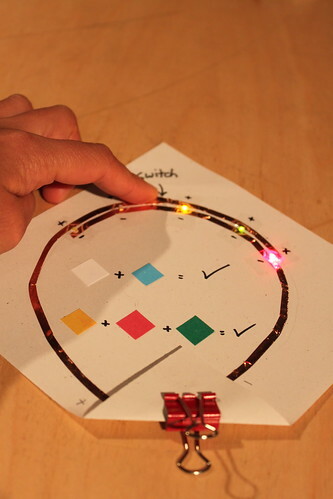 There are many ways of exploring paper circuits! 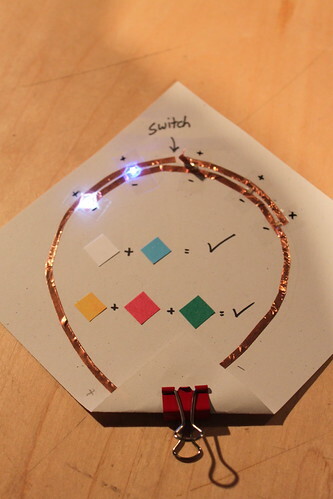 Michael, one of our visitors, added this lightning picture sheet after making a zigzag circuit so that the LEDs would illuminate his lightning. This is great! 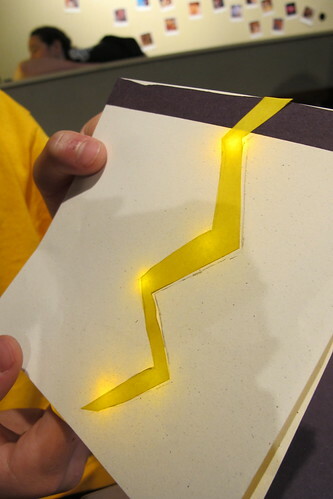 You can light up your drawings by making LED circuits underneath. 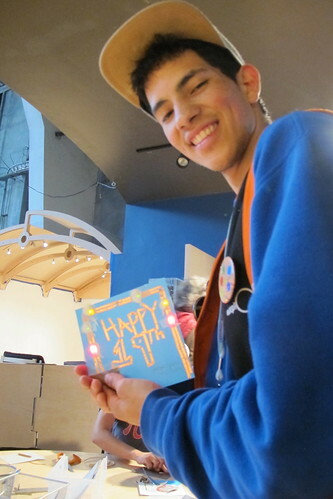 Oscar, one of our high school explainers, spent one hour with us and made this birthday card for his friend. He used different colors of LEDs to light up the balloons. This is awesome! I saw that other explainers were also making a message card for friends. I think it is great that experimenting with paper electronics simply turned into a personally meaningful project for them. Before the workshop, Jie had quickly made this sample to show visitors which LED colors could light up in parallel. The higher voltage group: white(3.2v) and blue(3.3v) can light at the same time. Likewise, the lower voltage group: red(1.9v), green(2.1v) and yellow(2v) can light too. But mixing the colors of the two groups does not work due to the difference in the voltages unless you use resistors. This simple guide was really helpful to explain to visitors what works and what doesn't. 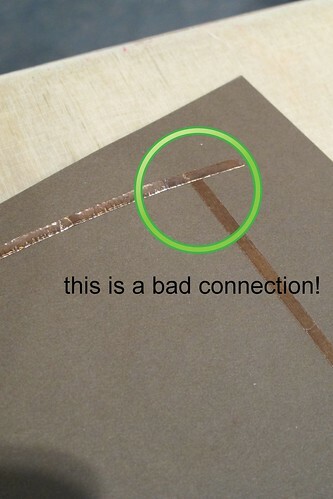 One thing to know about the copper tape is that the sticky side of the tape is not conductive. So if you want to add new tape to your circuit, you need to fold back the tape so that non-sticky side faces down to touch the existing tape. For young kids, it was a challenging to do so, dealing with the very skinny copper tape with their hands to fold it as they intended. So a lot of young kids ended up using soldering irons to make circuit connections on copper tape. I had never taught such young kids how to solder! 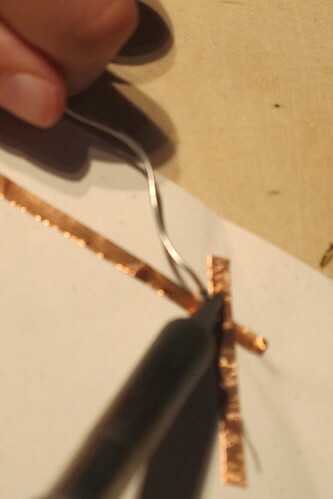 But soon, I realized soldering copper tape is not harder than soldering wires because the tape surface is all flat. 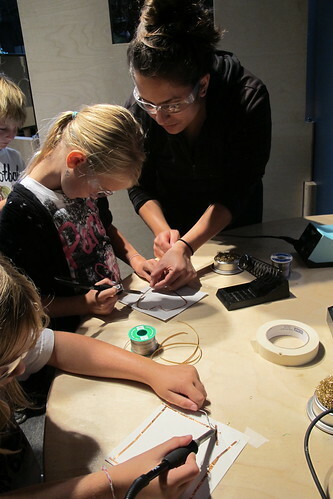 It was exciting for us too to know that six or seven-year-old kids can solder! Overall, we saw lots of excitements, engagements, and joys in people in the workshop. For us too, it was really exciting and definitely fun to work with visitors to share the process of figuring out how to build circuits as they intended. Stay tuned for the second part tomorrow! I would like to share some of highlighted creations from Jie's workshop with you! Hi, I am really interested in this, is it possible to put some videos for her instruction?